One of the great features of Launchpad is how easy it is to translate applications. Make sure you have a Launchpad login and then you can translate Simple Scan from your browser! Your translations need to be reviewed by the Ubuntu Translators team, if you are a member please review any translations! I recently upgrade to a new Dell Studio 15 and retired my old Inspiron. One thing I've noticed is the function keys are now secondary - these keys are now multimedia/system functions by default and you need to use the blue Fn key to activate the old F1-12 behaviour. Other Dell and Apple laptops (at least) seem to be doing the same thing. Is this the end of the function key? The Litl keyboard got rid of them entirely. The key combination to use them on my laptop is sufficiently difficult that they might as well not exist for me. - I can never rely on function key shortcuts in any software I write. - The existing window management shortcuts (e.g. alt-F4 to close window) don't work anymore. Now I understand when people complain how applications don't consistently bind the same key to close window (Ctrl+Q or Ctrl+W or something else or nothing?). - At the Lucid UDS we discussed Compiz keybindings - often these were bound to function keys. I notice the macbook uses the old F3 key for "show all windows". I hope some standard could emerge for these functions on PC keyboards. I can't say I'm going to miss them overly. Please try it and report any problems you have. To install add the PPA and install the simple-scan package or build from source. Yes. This is the first functional release. The GUI is being redesigned for 0.8. The 0.7 release should contain all the functionality required for 1.0.
Who is simple scan for? 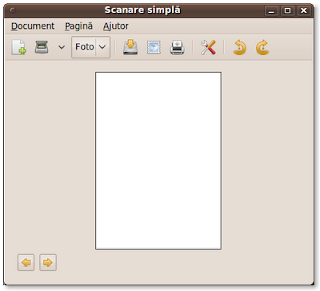 This application is designed for the 95% of users who just want to connect their scanner and quickly have the image/document in an appropriate format. How does this relate to GNOME scan? 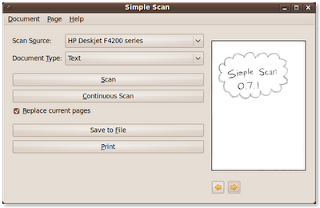 Simple scan does not use the GNOME scan to get the scan data. This is because Ubuntu 10.04 is a Long Term Support release and bringing the whole GNOME scan stack into main is risky (it was previously proposed for 10.04 but was not found to be stable enough). There is an open bug to change to gnomescan when that is appropriate. Why is this a problem? As error->message cannot be checked it may contain a printf flag sequence, e.g. "Invalid data: 'g^y#%s'" (i.e. %s) that would cause run-time to try and access a non-existent argument. It could be worse and the format string could be user-input that is attempting to exploit your program. This year I was able to attend the Gran Canaria Desktop Summit which was great as I hadn't been to a GNOME meetup before. The community is very alive and active! There are many companies and individuals working on improving GNOME. The GNOME foundation is well organised and financially sound. Donations are a big part of this success. If you contribute to GNOME in any way then become member (it's easy to join!). ...which may be getting closer. Banshee is splitting it's backend out into Banshee Core which will be a database of music, video and photos on your computer. Hopefully there will be some convergence between this and tracker, zeitgeist and akonadi to provide a seamless user experience to your media. GNOME Shell is still young but is showing some interesting breaks from the traditional desktop. Project Mallard is going to make the GNOME documentation much better. Testing initiatives like Mago and LDTP should see an increase in the quality of software. The future looks really good!